← Går världen mot ett nytt storkrig i Västasien? Are We Heading For A New Great War in Western Asia? Posted on 25 augusti 2011 | Kommentarer inaktiverade för Are We Heading For A New Great War in Western Asia? 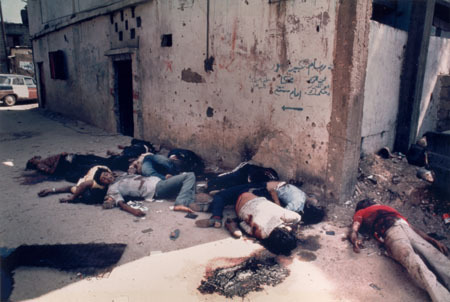 Picture: The massacre in Sabra and Shatila, Lebanon 1982. The uprisings in the Arab World are far from clear-cut. Some consider they were initiated by the West to get rid of leaders who are washed-out (Mubarak), or hated (Assad), or to gain control over oil (Gadaffi). Even though this is part of the picture, it can hardly be denied that that the uprisings are genuine protests against systems that repress, persecute and kill their critics. In this sense the uprisings are ”apolitical”, despite the fact that it is in the interests of various political and religious groups to try to start them off, or exploit the turbulence and take control when the storm dies down. And what will become of the Palestinians? Will they, as always, be victims of international politics, driven from their country, their lands stolen? While writing this, there are reports on Mainstream media that the rebel army in Libya has now captured Gadaffi’s base in Tripoli. At the same time, we are also told that the rebels, who engage in plundering, have worked closely together with Nato and that England and France have special troops on the ground. Large headlines tell us ”Oil Companies on the way to Libya”. As yet, we have no knowledge of what will happen to Libya, but we may well ask whether the country will remain independent in any important way. It is difficult to assess information about the Arab uprisings. The first victim of wars is always the truth. But even with journalists on the scene information becomes biased. However, Al Jazeera has played an important role in offsetting western media. The tabloid Expressen (largest in Sweden) has established a direct link on its website in order to offer its readers Al Jazeera’s live coverage. There is, however, no getting away from the fact that Al Jazeera’s owners sit in Qatar, a small artificial kingdom and former British protectorate that won its independence as recently as 1971. Both oil and Sunni Islam underpin its interests. Journalists and the media are always, to a certain extent, their master’s voice – everywhere. However, there is still supplementary information to be had on the internet for anyone with an inquiring mind. At the onset of the revolt in Syria, there were reports of the murder of peaceful demonstrators and as well of soldiers and police. But it was when some mass graves containing many soldiers was discovered that it became clear that this could not possibly have been carried out by a few armed demonstrators, or even by special forces from CIA or Mossad. It was more likely that Syrian security forces had executed soldiers who had refused to shoot at their own people. We who are old enough to have been called upon to do national service, today transformed into task forces in foreign countries, will perhaps find this easier to understand. Is it the UN’s new role to legitimise wars and interventions? The UN has also been dealt a new role during the past six months, legitimising NATO’s interference in the affairs of sovereign states, as now, in Libya. According to the UN charter, intervention in a conflict can only take place if world peace is at stake which is hardly the case here. The UN preamble has been twisted and turned around. The eminent American lawyer within the field of human rights and international law, Curtis Doebbler, has commented on this in the article ”The use of Force against Libya: Another Illegal Use of Force” (1). But even if Doebbler is right, it does not necessarily follow that people’s protests against Gaddafi are wrong. On the contrary, many have lost their dear ones to torture or execution because of critique of the regime. Afghanistan was never a UN mission; nor was NATO’s intervention in the former Yugoslavia, or the occupation of Iraq. It is obvious that these wars bypassed the UN and international law and that attempts were made after the event to cover up. The western model of puppet regimes, or manageable despots who keep their own people under the heel of a boot, is now a thing of the past. Ordinary folk have had enough. They want a say in the matter. This is the reason for the uprisings in the Arab world and for the UN’s new role as the legitimiser of war, or guarantee for democracy, depending on whether or not you are capable of seeing the world as ”upside down”. Everybody wants democracy, but what is it? Yes, of course it is indeed contradictory when people in the Arab world say that they want democracy while, at the same time, their culture and economy has been torn apart by the colonialism and imperialism of ”democratic” countries in the west. This is the subject of the article “The Uprising in the Arab World –Reflections on Democracy” (2). The power of the people, liberal parliamentarism or theocracy – they are all different. Whether people in the US have more power than people in Iran is, to say the least, a tricky question. What is the role of Israel? You do not have to be a military strategist or a prize-winning journalist to see that it is in the interests of Israel to weaken and divide its surroundings in order to consolidate, defend and expand the Jewish state. What Israel does not want is a democratic government in one of the Arab countries; that is to say a government that, by and large, expresses the will of its people. The reason for this is that Arabs, as a rule, sympathise with their brothers and sisters who have been expelled from their country and had their lands stolen, that is to say the Palestinians. And people are not easily bought, especially these days when money will shortly be worthless pieces of paper. History has taught us that great wars follow crises of economy. The 1982 Zionist plan for the Middle East, the so-called Kivunim Plan, spoke of dividing and weakening the Arab countries, partitioning Iraq into 3-4 parts and other things. See further the article, “Israel and the new American Century” (3). The article discusses Israel’s role in American foreign policy, with its sights firmly set on Iran, an Iran that is today so strong that it would lead to a devastating war if the plans were put into action. And the Persians are not easy to handle. Old warriors and incurable patriots, whatever their opinion of their own regime. The Palestinians have enjoyed better lives in Syria than in Lebanon and Jordan, but they now risk becoming very trapped. Hamas and other Palestinian resistance movements, both Islamic and others, have their offices in Damascus. How will these be affected? They have to do some quick thinking. The regime has already attacked a large Palestinian refugee camp. It is over for Assad, it is not possible to keep people’s trust while at the same time shooting unarmed, peaceful demonstrators. Hamas may have to leave Damascus and distance itself from the present regime. There is otherwise a risk that mass graves with Palestinian bodies will be discovered after Assad has gone. We have Lebanon 1982 in fresh memory, and the massacres in Sabra and Shatila under the surveillance of Israel’s military. And Hizbollah risks losing credibility if it does not become more independent of Syria, or perhaps even more so of Iran, whose double-dealing in Afghanistan and Iraq divides the Arab people’s resistance to the new crusaders – despite anti-Zionist rhetoric. It is a mistake, however, to believe that it is the contradiction within Islam between Shia and Sunni that is the driving force. Both phalanxes resist, or cooperate with their occupiers, but in different countries. The Golan Heights remain occupied regardless of who rules in Damascus, so we shall probably not see a rapprochement between Syria and Israel, but in a civil war the alliance between Syria and Iran would weaken. One wonders how much power Assad really has? Assad is just one of many players and the question is how freely can he move? He is probably stuck in the system, as opposed to Gaddafi who personifies the system in Libya. The corrupted power elite is fighting for its privileges now. If Assad falls, all those who live by the system fall, within the military, secret police and bureaucracy. They are fighting for their lives and their positions. If civil war breaks out, it could go on for a long time. The popular uprisings in the Arab world will probably spread to Iran, where it will surely not be enough to continue blaming Usrael, even though the opposition, up until now, has been fuelled from there. The demonstrations in Israel have not been about changing the regime, replacing the Jewish state with democracy and equal rights for all, and hence will not affect relations between states in the Middle East. This will happen only when the UN resolutions concerning evicted Palestinians’ right to return are obeyed. What is most worrying at present is the UN’s and the western alliances’, and also Turkey’s, threat of intervention in Syria. This could be the start of a great war in Western Asia if Assad does not surrender in one way or another. It is difficult to believe that Hizbollah and Iran would be content to watch from the sidelines if Syria is attacked.